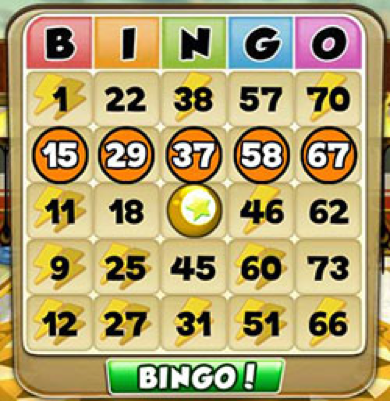 Bingo Blingo is a fast-pace social Bingo game that is fun for everyone! You can play it on Facebook or iOS or Android. When a number on your Bingo card is called, daub that square by clicking on the number. Click on the square again to undo your daub. When you think you have a Bingo, click on the green "BINGO!" button on the card to call it. If you click on "Bingo!" 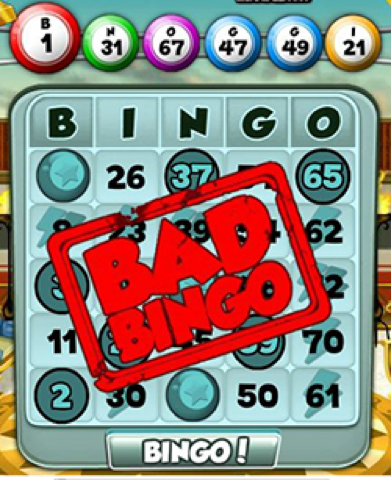 without actually having a Bingo, you I'll get a "Bad Bingo" and lose all rewards earned on that card. Coins allow you to purchase Achievements, Smileys and Power-Ups. What Can I Do With Tickets? 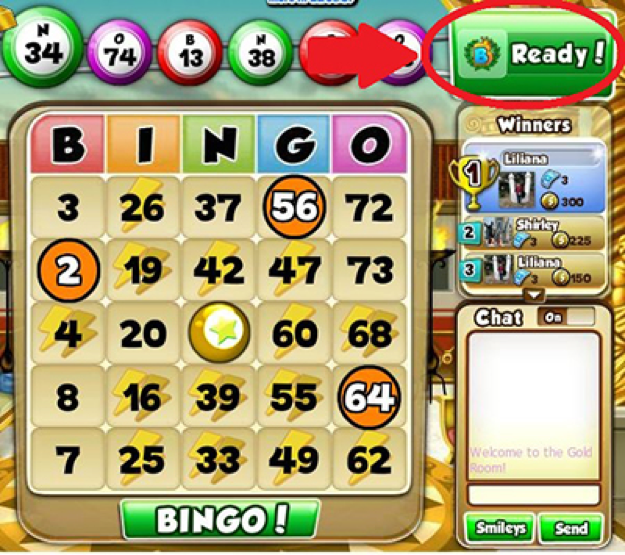 Tickets grant you the ability to purchase Bingo Cards. 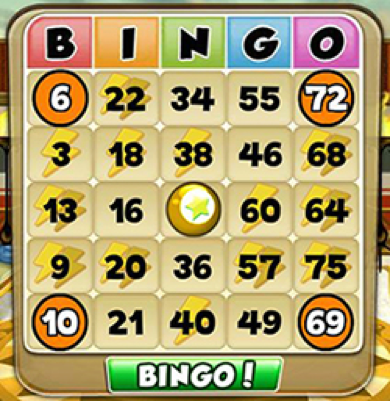 The more tickets you have, the more Bingo cards you can buy each round and the greater your chances of a BINGO! How Do You Get Winning Patterns? Bingo Blingo also has a special pattern rooms and blackout rooms. Please refer to the Special Rooms section of the FAQs for more information. Bingo Blingo has blackout rooms and special pattern rooms. In blackout rooms, the only way to get a bingo is to daub all the numbers on the card! In special pattern rooms, the pattern to get Bingo is marked on that card. Daub all the numbers on that pattern to get a Bingo! What Is The Disco Room? The Disco room is a very unique room. 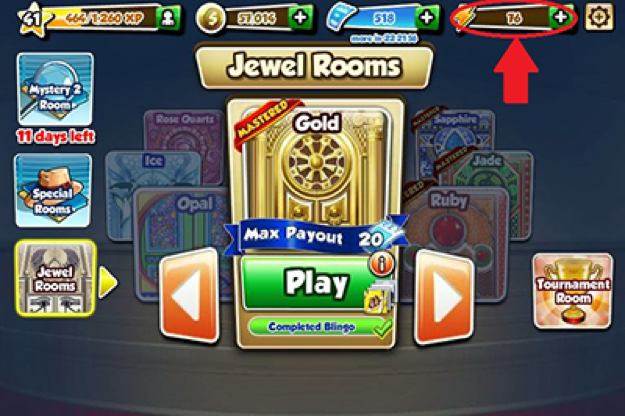 During the weekdays, it’s a normal Bingo room, but on Saturday, it’s a flashback to the 70’s, with extra payouts and unique achievements! Achievements can be viewed from your Profile, which is accessible through the upper left corner of the menu. Click the Profile button to see your achievements, Power-Ups and smileys among other things. A Blingo is a set of achievements. Earn all the achievements in a room to get the Blingo and win the prize. Yes! You can purchase achievements by going to your Profile and clicking on the achievement you would like to purchase with Coins. What Is The Megabingo Card? Megabingo Cards are mega sized blackout Bingo cards! Every round you play (except for Tournament and special Blackout rooms), the numbers you daub go into a Megabingo Card. Fill all the numbers in the Megabingo Card to complete it. Fill 12 Megabingo Cards to earn the Megabingo Blingo prize! 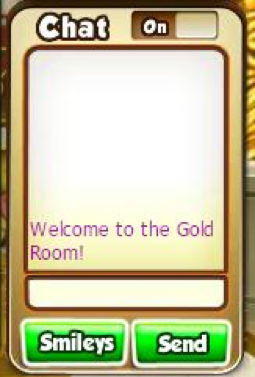 What Is The Puppies And Kittens Room? 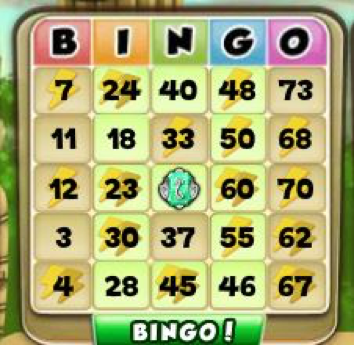 To win a Bingo in the Puppies and Kittens room, daub squares until the pet crosses over the flashing path, then press Bingo! How Do I Ignore Someone In The Chat Room? Currently, you are only able to turn off the chat as a whole and not mute individual players. Offensive word filters are in the process of being implemented. How Does 'My Team' Feature Work? Your Team is comprised of your “active” friends - friends who are playing during the week. The more teammates you have, the more daily bonus Tickets you will receive. The more bingos your Team earns during the week, the more prizes you will earn in the Weekly Bonus bar. How Do I Collect The Individual Weekly Bonuses? To collect your Bonuses, simply click on the reward located on your Weekly Bonus bar. 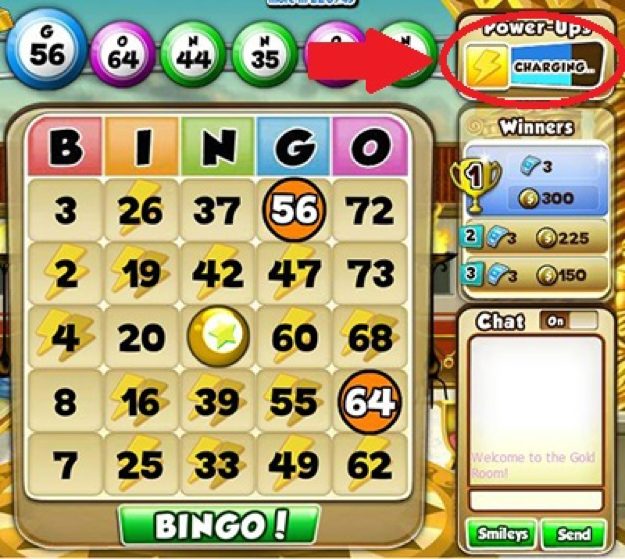 Power-Ups increase yours odds of winning in Bingo Blingo; others help to give you extra bonuses. 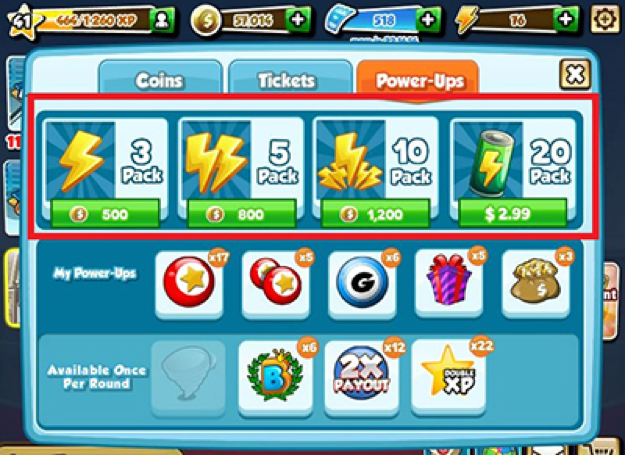 For more details on specific Power-Ups, please see the FAQ: What Power-ups are available and what do they do? Daub squares with to fill the Power-Up bar. Daub squares with to fill the power up bar twice as fast. 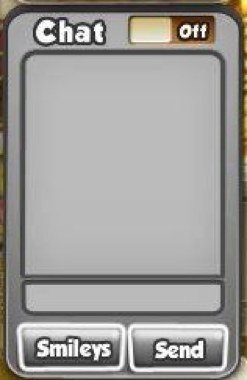 When the Power-Up bar is filled, click on it to activate a random Power-Up. What Power-Ups Are Available And What Do They Do? 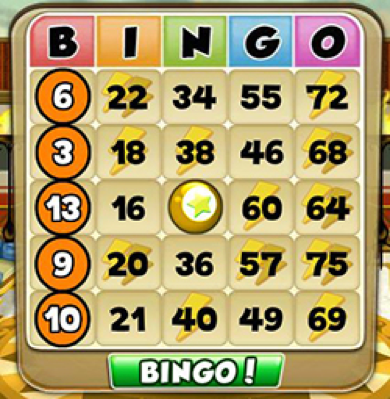 Single Daub: One random, uncalled number on each Bingo card is marked for you. Squares marked by the Single Daub Power-up will have a solid circle. 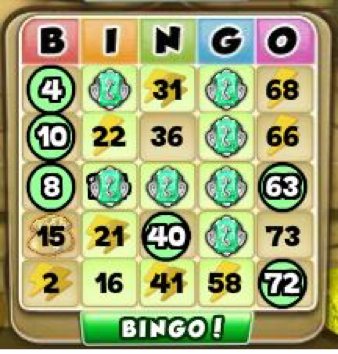 Double Daub: Two random, uncalled numbers on each Bingo card is marked for you. Squares marked by the Double Daub Power-up will have a solid circle. 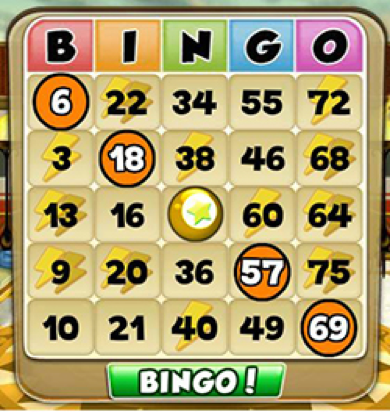 Column Daub: One random, uncalled number on each Bingo card from your column of choice will be marked for you. Squares marked by the Column Daub Power-up will have a solid circle. 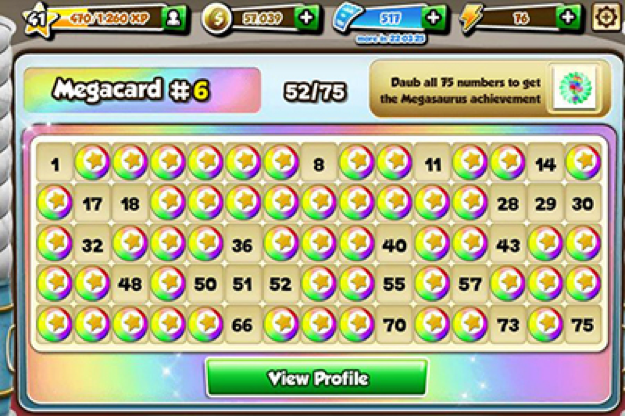 Gift Box: One mystery Gift Box is added to each Bingo Card. If that number is called, daub the square marked with the mystery Gift Box to collect the gift. 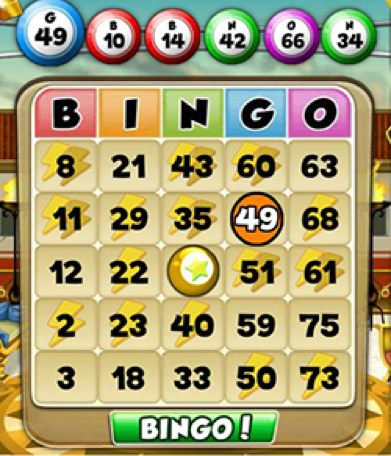 Coin Reward: One bag of bonus Coins is added to one random, uncalled number on each Bingo card. If that number is called, daub the square marked with the bag of Coins and collect the Coins. 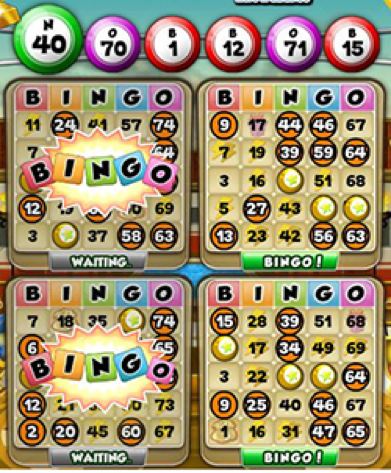 Instant Win: One random, uncalled number on each Bingo card turns into an instant win. If that number is called, daub the square to get Bingo! This Power-Up is available only once per round. 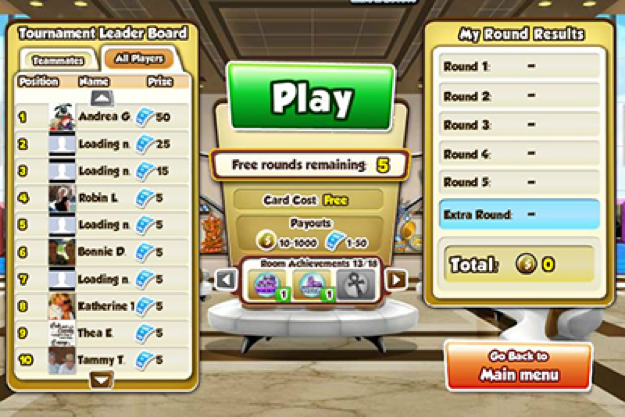 Double Payout: The reward for Bingos in that round are doubled. This Power-Up is available only once per round. Double XP: You will receive double XP on every number daubed for the rest of the round. This Power-Up is available only once per round. How Many Power-Ups Do I Have Left? Your Power-Ups inventory can be found by clicking on the + button on the top right corner of your screen. Can I Purchase Individual Power-Ups? No, currently all Power-Ups are purchased in packs of various sizes. Can I Purchase An Additional Round? Yes! You may purchase one additional round for $0.99. How Does The Daily Tournament Work? 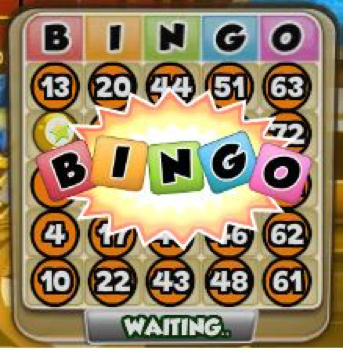 Every day, you can play up to 5 free rounds of Bingo in the Daily Tournament. Everyone who plays earns a prize! INTERNET EXPLORER: Click TOOLS - INTERNET OPTIONS. To the right of Browsing History click DELETE. To the right of Temporary Internet Files, click DELETE FILES. Then click YES (It may take a couple of minutes). When complete, click CLOSE, click OK.
GOOGLE CHROME: Click the "wrench", click OPTIONS, then UNDER the HOOD, click CLEAR BROWSING DATA. The only box that needs to be checked is EMPTY THE CACHE, click CLEAR BROWSING DATA. (It may take a couple minutes). When complete, click CLOSE. Mac users on SAFARI: From the Safari menu, click Reset Safari, then select only EMPTY THE CACHE and REMOVE ALL COOKIES, then click RESET. FIREFOX: From the TOOLS menu click CLEAR RECENT HISTORY>from the TIME RANGE TO CLEAR drop down menu select the time range or select EVERYTHING. Click the down arrow next to DETAILS to choose which elements to clear and then click CLEAR NOW. Browser programs are frequently updated to add functionality and address problems. If you are using an older version, you may not be seeing websites the way they are meant to be displayed, and there could also be security issues. To check what version you currently have on your computer, open the browser program, go to the toolbar up top, click on "Help," and then click on "About [the name of the program.]" The easiest way to update your web browser software is to download the update over the Internet. You can download the update for free by going to the browser’s website and clicking on a link that usually says something like "download now." How Do I Update The Flash Player?